How to fill my waiting room? Running your own business is hard, and the healthcare market is very competitive. If you are looking to expand your reach and bring in more patients, here are some important ideas to consider. The most valuable resource at your disposal is your current patient base. By being an attentive and relatable provider, you are encouraging word of mouth recommendations by your patients. When answering questions, it’s a good idea to having educational materials available for your patients to take with them. Keeping resources like this easily available in places like your waiting space allows your patients to stay informed and do some further reading when they have questions. Reach out to local groups and organizations about donating your time. Being part of educational talks like lunch lectures or local wellness fairs is a great way to connect with your community in a different setting. A Physician Liaison can help you partner and network with other local providers. This is beneficial for more direct referrals as well as being more helpful to your current patients when you can point them to providers you know personally. Market your practice constantly by posting on your website, blog, and social media pages. This helps keep you relevant to your online audience as well as building your credibility to anyone who stumbles across your content. Not sure where to start? Overwhelmed? Prescription PR can help you optimize your online presence. Be responsive to online posts and messages. Just like when you’re in an appointment, your patients want to feel heard and understood. You can encourage these feelings by being attentive to all your online communications and replying with positive and informative posts. Make sure to ask for online reviews from your patients. When potential patients are looking for a new provider, they will turn to the internet. You can increase their chance of choosing to research you by having lots of positive reviews from current patients about their experience with you. 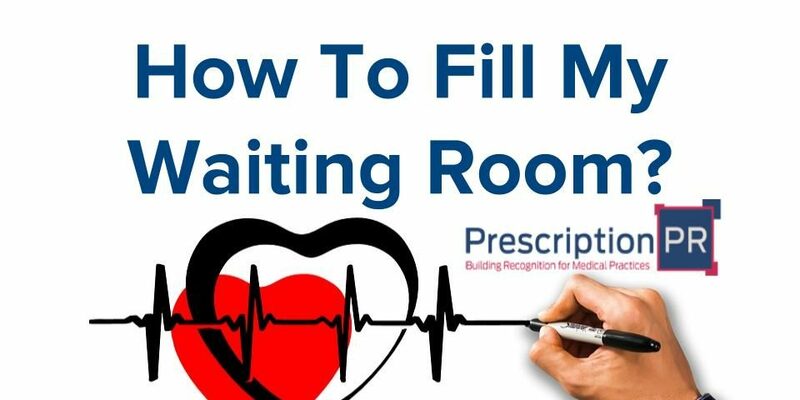 Want to learn how to fill your waiting room? Contact us at Prescription PR today!